True story: In late 2002, I traveled with my parents and brother to visit my sister in France, where she was studying abroad for the year. I was greatly looking forward to the land of bread and butter, crepes, and fashionable French women. But as soon as I arrived in Paris, I came down with a bad case of strep. Fortunately, my mom is the most prepared traveler ever, and she had a z-pack of antibiotics with her. Nonetheless, I was pretty miserable for the first 5 days. Just as I was able to start eating and acting normally again, we visited Carcassonne castle (yes, it’s not just a board game–it’s a real place!). That evening, we sat down as a family at a tiny restaurant close to the outer wall of the castle. My mom had selected the restaurant because a travel guide said that it was know for its cassoulet, a hearty French stew. This should have been the perfect dish for someone emerging from the depths of strep throat–it’s warm, soft, and delicious. However, for reasons that are beyond me, even though everyone else ordered cassoulet, I decided that I would find the jewel of the menu. I ordered fish. The meal came, and each member of my family was served the most beautiful cassoulet. My dish took a little longer, because no one ever orders the fish at this restaurant, and eventually I was served a large, cold, whole fish. Bones and everything. Big eye watching me the whole time. My family members raved of the amazing cassoulet while I picked my way through the bones. I was tempted to procure a few spoonfuls of the stew, but I didn’t want to give anyone strep, and they were enjoying the dish so much that I didn’t want to take it away from them. After all, I had made the choice to order fish. As you can tell, this experience has been burned into my memory. I recently relayed the story to a friend, and she took it upon herself to look for cassoulet in St. Louis. Sure enough, there’s a local French restaurant that has it on their menu. 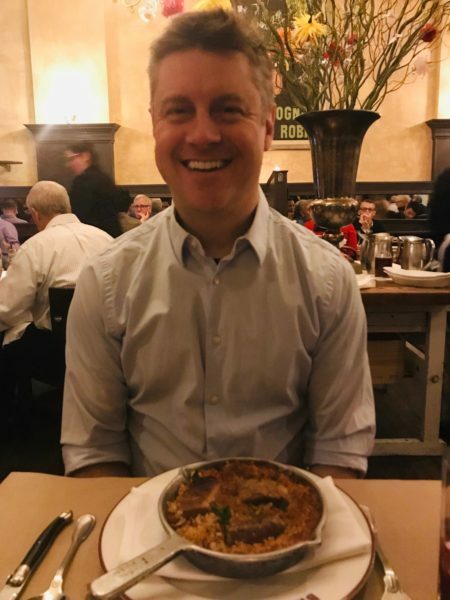 So I’m happy to announce that 16+ years after I missed out on some of the most delicious cassoulet in France, I had the pleasure of eating the most delicious cassoulet in St. Louis at Brasserie. On a cold winter day, it was warm, salty, and hearty–it hit the spot perfectly. Have you ever had a food-related regret that you’ve been able to eventually make up for? This entry was posted on Thursday, February 7th, 2019 at 11:01 pm	and is filed under confessions, food, travel and tagged with travel. You can follow any responses to this entry through the RSS 2.0 feed.